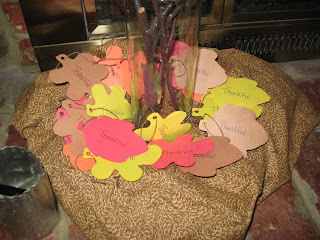 Last year, our family started a new Thanksgiving tradition called a Thankful Tree. I can't take the credit for coming up with the idea though. I read about it in Family Fun magazine. Our whole family loved creating the tree, then writing what we were thankful for on the leaves. 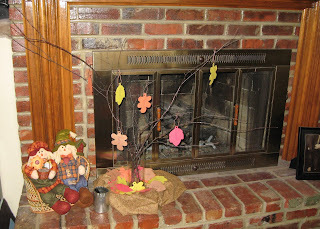 Here's how to make your own Thankful Tree . . .
2. Once you've chosen your branches, get out your vase. If you have young children, be sure to use a vase that either unbreakable or that you won't cry if an accident does occur. Lay out your branches, and begin removing some of the smaller branches and putting them in your vase until you like the fullness. You may need to "trim" your branches. Try to do this at the end that will be in the bottom of the vase. Discard all unused branches. 3. It's time to make those branches extra pretty! Remove them from the vase. Take the branches and the glitter spray outside. 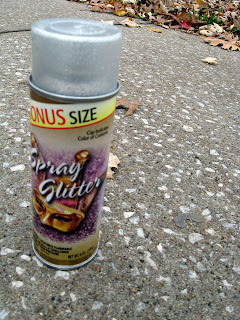 Hold one branch at a time while you spray it with the glitter. Be sure to turn the branch so you get all the sides. 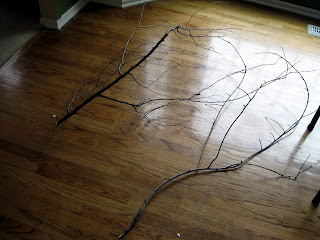 Once they are dry, replace the branches in the vase. 4. Now for the more tedious part of this project - making the leaves. 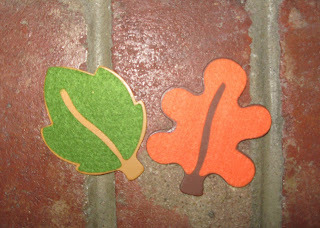 If you know somewhere that has leaf die-cuts, you may want to purchase them. I couldn't find anywhere that had the right size. But I did find these wooden craft leaves for about fifty cents each. They make great templates that will last year after year. Pull out your construction paper. Be sure to use lots of reds, yellows, oranges, and browns. Trace & cut out your leaves. 5. Use your Hole Punch to place a hole on the end of the leaf stem. Then thread the string through and tie a knot at the end. I used a brown craft string. Yarn works well too. I found brown to be a good color because it blends in with the branches. Once the leaves are done, arrange them around the tree. Place some pens nearby. Last year, I put the leaves and pens on a silver tray next to the tree. This year, I placed the leaves all around the tree, with a pen holder filled with pens next to it. Voila! Your Thankful Tree is complete! 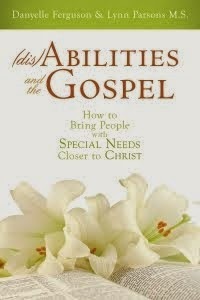 All you need to do is place it somewhere everyone can access it. Last year, I placed our tree on a side table. This year I decided to try the fireplace hearth. I was surprised how many leaves our family filled out last year. 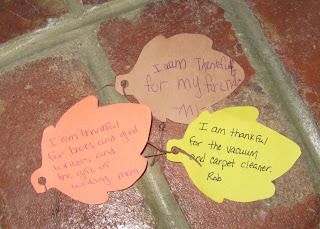 Each day, the kids filled out one leaf with something they were thankful for. Our then three-year-old told me what he was thankful for, and I wrote it out for him. The older kids had fun coming up with things they thought our one-year-old was thankful for. Be sure to remind your family members to put their names on their leaves! The kids loved putting their leaves on the branches. Our oldest daughter put a lot of thought into the placement of each of her leaves. It was amusing to watch! Our tree was gorgeous with all the fall colors. The best part was on Thanksgiving Day, we each took turns taking a leaf off and reading it to our family. We saved them all in a Ziploc bag and labeled it with the year. 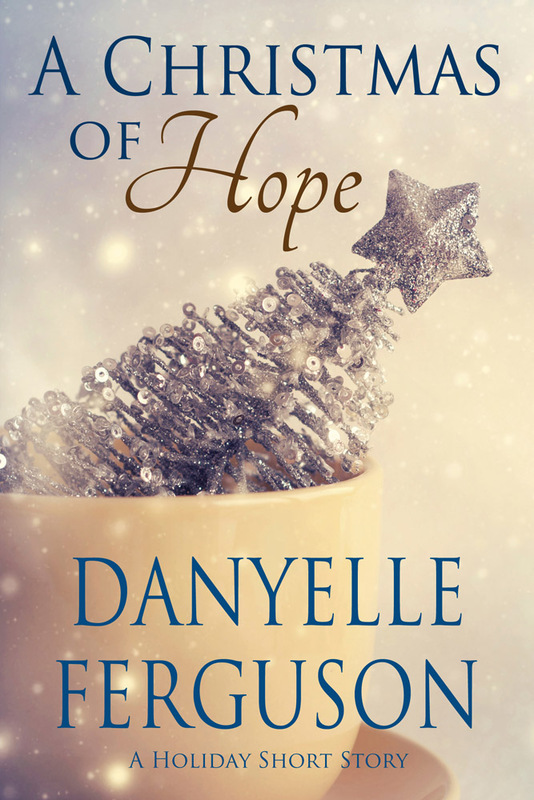 With all the hustle and bustle of early Christmas preparations, Thanksgiving sometimes gets lost in the holiday shuffle. This is a wonderful activity to help our families remember the spirit of the Thanksgiving season. I would love to hear what your family does to celebrate Thanksgiving. Please leave your ideas in the comment section! Also, don't forget to enter the Unwritten Contest! It ends on the 15th! That's a cute tradition! I think I'll send your blog link on to my son and daughter-in-law, in case they'd like to try it. By the way, thanks for stopping at our LDS Humor blog and commenting. We appreciate the "congrats" that you left us! I'm really excited about your book! Hurray! That is a great idea. Last year I had a notebook, but I love the visual of a tree with colorful leaves. I'll have to try that sometime. Hi Amy! I think a Thankful Tree would look awesome in your bedroom - or downstairs where you do all your sewing. On Thanksgiving Day, all your nieces and nephews could fill out leaves. Think of how fun it would be to read them all! So cute--we're doing a paper version you stick the wall that I got from an ordinary mom blog, and my kids are really enjoying it. That's sounds like fun! I'd love to hear more about it.